Volkswagen AG has joined the Clean Energy Partnership. The world’s most versatile hydrogen demonstration project for emission free mobility with two service stations in Berlin thus welcomes a further partner and now includes 11 companies and 17 hydrogen vehicles. “For us, joining the 'CEP' is a logical and important step towards the future. Our commitment further underlines our support for sustainable mobility and, at the same time, provides us with important application-related information from the demonstration project.” said Prof. Dr. Jürgen Leohold, Head of Group Research at Volkswagen AG. Volkswagen is conducting intensive research into hydrogen and fuel cells in the context of its fuel and power train strategy. 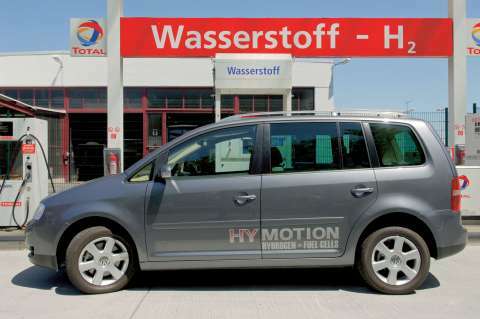 Volkswagen brings a VW Touran HyMotion to the CEP passenger car fleet. The vehicle was developed at the Volkswagen Technology Centre in Isenbüttel and initially underwent intensive practical testing in the USA. The tests in Berlin represent the vehicle’s premiere in Germany. “We expressly welcome the decision by Volkswagen AG to join the Clean Energy Partnership. Together with the recent participation of TOTAL, this confirms that CEP is on track for becoming the most significant European project for hydrogen-based mobility. We look forward to cooperating with a total of five automakers and welcome the further expansion of CEP’s competence in the field of hydrogen as the fuel of the future” said Dr. Klaus Bonhoff (DaimlerChrysler), Head of CEP’s Steering Committee. The Federal Ministry of Transport, Building and Urban Affairs also expressly welcomed the commitment of a further automaker to CEP. CEP is a component of the national sustainability programme and is sponsored by the Ministry as one of the leading innovation projects for emission-free mobility. With its versatility, CEP also creates the optimum basis for the lighthouse projects planned under the “National Hydrogen and Fuel Cell Technology Innovation Programme”. Since November 2004, the opening date for the first CEP hydrogen service station at the Messedamm in Berlin, the CEP demonstration project has been carrying out sophisticated everyday operations without problems. A great deal of progress has been made since then. The experience of customers, technicians and operators will be evaluated in 2007 and presented to the public. The Clean Energy Partnership (CEP) is an international association of the following companies: Aral/BP, BMW, Berliner Verkehrsbetriebe (BVG), DaimlerChrysler, Ford, GM/Opel, Hydro, Linde, TOTAL, Vattenfall Europe and Volkswagen AG. Its goal is to tap the technological potential of hydrogen as a source of energy, conducting tests with a view to suitability for routine use and system capability. The Clean Energy Partnership initially runs until December 2007.